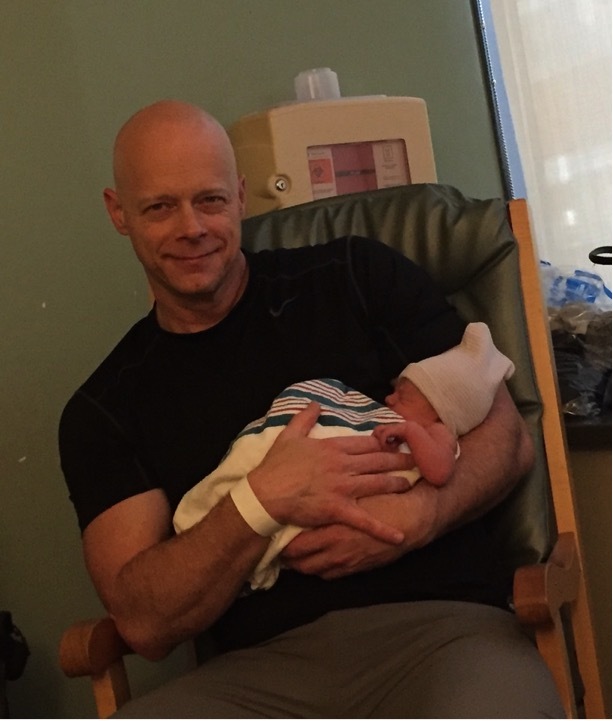 At SCW Fitness Education, we consider our presenters our family, which is why we couldn’t be more excited to share the update on our newest member! On January 19, 2018 at 11:38PM CST, Sarah Joy Weichert came into the world at 19 ¾ inches and 6.2 pounds. Sgt Ken® and his beautiful wife, Stephanie, could not be happier. Both Mom and baby are doing well! HOOAH! Come to MANIA® and offer Sgt Ken® a congratulations in person! Experience all he has to offer when it comes to fitness! Resistance bands and tubes have been primary tools within exercise programs for many years; however, due to their simplistic design, their versatility and efficacy is often overlooked and underappreciated. Here, we will take a closer look at the strength band and identify a few of its specific applications. Strength Bands are referred to by many names such as Monster Bands, Power Bands, and Super Bands just to name a few. Their thick and durable construction lends to such powerful terminology, but Strength Bands assist with flexibility and mobility exercises as well as provide primary, secondary, or inverse resistance to your workout. Strength bands provide primary resistance in a variety of push and pull exercises performed alone or with a partner. When exercising alone, use a strength band as resistance for a bicep curl, shoulder press, triceps extension, torso rotation, chest press, row, chest fly, reverse fly, and any other exercise you are inspired to create. 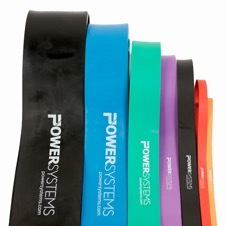 Power Systems Strength Bands range in resistance from extra light (orange) to heavy (purple) and are best suited for these types of exercises based on the fitness level of the individual. Strength bands can also provide secondary and variable resistance to bodyweight and barbell exercises. A band positioned behind the back under minimal tension and secured under both hands will add variable resistance to push-ups. Many weightlifting platforms and benches have attachment points that allow you to add a strength band to both sides of a barbell to add variable resistance to traditional lifts such as a bench press or squat. Another popular application for strength bands is adding inverse resistance to bodyweight exercises. Strength bands can be wrapped around pull up and dip bars to act as a counterweight and allow users to perform these exercises in a full range of motion with only a percentage of their body weight. For example, a person weighing 200 lbs. can use a blue, ultra-heavy strength band to remove up to 100 lbs. of their weight from the exercise. This is a great way to learn proper mechanics of body weight exercises as upper body strength develops. As a person gets stronger, replace a heavy resistance strength band with the level just below it – repeat this process and training program until the band can be removed completely. Use the strength band resistance level chart below to help determine which band(s) you need for yourself and/or your clients. Level Color Resistance in LBS. Since there are SO many exercises you can do with strength bands, we have asked our Master Coaches to put together a few sample workouts to get you started. Stock up and get your bands at special event pricing at every single MANIA® event! Find one near you! One of the latest trends to hit the market is Hydro-Inertia® training with water filled products such as the Kamagon® Ball and Surge®. 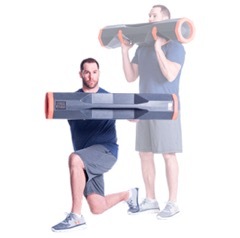 Trainers and instructors use these products to enhance strength and endurance as well as the balance, stability and reactivity components of fitness. They are also extremely useful in improving proprioception and kinesthetic awareness. One of my favorite features of these products is the ease of varying the challenge of the exercise just by changing the amount of water inside. You don’t need an entire line of different weights (i.e., dumbbells) taking up space; just vary the amount of water to increase or decrease the challenge! If you are a personal trainer that travels from client to client and house to house, take into account how easy it is to transport this type of equipment – just add water! Another benefit of incorporating the Kamagon® Ball and Surge® into your programs is the stealthy way that Hydro-Inertia® enhances a workout by engaging the core. Everyone wants to work the core! Due to the dynamic properties of water, the entire body has to respond to the water actions. The core is activated as you REACT to the demands of the ever changing environment that is being created. Think of it like “controlled chaos” – the workout can actually feel different every time even when the exercises are the same. Because of the great variety of exercises, these products seamlessly integrate into small group training, circuits or HIIT classes. The trick of turning “toys into tools” is education. Attend a workshop or conference session that teaches you how to properly use the equipment. It is essential to learn not only how to use the product with good form but how to care for the product as well. Receive solid information on how to integrate these tools into existing classes without overwhelming the members. All the new tech and gadgets aren’t worth anything if we don’t create an environment of success for our clients and class participants. One of the first things I like to do with a new piece of equipment is a familiar exercise or drill to get a feel for the new equipment with a movement pattern that is already comfortable. You don’t have to create a three-ring circus every class, every time. As instructors and trainers, I am willing to bet that WE get bored way before participants do! Keep it simple and Introduce new ideas in stages. Let participants feel successful and keep it fun! Pam Benchley is a Hedstrom Fitness Master Trainer for BOSU®, Kamagon® and Surge®, and a provider of many other workshops including Stages® Indoor Cycling, balance training, and functional/active aging training. Pam currently serves on the faculty at the State University of New York at Fredonia and is a competitive triathlete. We see research focused on teachers, athletes, and nurses but group fitness instructors and personal trainers have been left out. Can you help us change this disparity? A study supported by a PhD student at Baylor University seeks to analyze our feelings of burnout. Through this, we hope to get a better understanding of effective coping strategies and to assist fitness instructors and trainers with their mental health and lessen feelings of burnout. SCW Fitness Education is supporting this research. Please join in and help us learn how to deal with our physically and mentally draining fitness carreers by taking this quick survey here. The Women in Fitness Association (WIFA) will hold its first live event in San Diego on Thursday, March 22, at the Omni San Diego Sail Rooftop Terrace during IHRSA 2018. The theme for the event is Women who ‘birthed’ an industry. The innovators, creators, movers, and shakers who came forward with educational development, programming, and teaching skills to help grow the industry. These early starters created and shaped Industry Standards and Guidelines. WIFA will feature one woman each week leading up to the event, which will include table topics highlighting each woman honored intended to spark inspiration and conversation among the members, many of whom will be meeting face to face for the first time. WIFA debuted in May 2017 and was founded to create a place for women to gather in community with one another. The WIFA vision is that every woman professionally representing the industry can find her place and rise to her fullest potential. WIFA aims to see more women in the boardroom, championing each other to achieve success through collaboration. WIFA CEO & Founder Lindsey Rainwater formed the association from a place of pure intention to partner with women across the globe. “Considering women account for 80 percent of purchasing decisions in the average household, having female representation at the table provides a well-rounded perspective within any business, says Rainwater. It’s no secret that Winter 2018 is freezing. When stuck inside, it can be hard to even work up energy to get active, but it’s important for kids and adults alike! For children, not only are you teaching them healthy habits to maintain for life, but you are also helping them develop strong cardiovascular, muscular and skeletal systems. Furthermore, active kids are less likely to struggle with ADHD or depression and tend to struggle less in school. However, what do you do with grumpy or wild kids? Here are 5 of our favorite games to get you and your family moving inside your apartment or house – no special equipment or expensive outings needed! Younger kids need nearly no direction when given a room filled with balloons – they go wild! For older kids, suggest a modified game of Hot Potato to see how long they can keep the balloons off the ground! Find objects to hide in the house – you can make an old fashioned scavenger hunt list and hide objects or make a game of finding one thing (library books, puzzles, etc.). When the children find the piece, have them run back to “base” to put them in a pile. You know those great repetitive books – use them to your advantage! Each time you say, for example, Green Eggs and Ham, have kids jump up high and reach for the ceiling. The rules are fairly simple; when the music is on, everyone dances. Loud music and silly dancing will get the party rolling! When the music stops, everyone freezes. Adults should vary the length of time the music plays to keep it interesting. Encourage kids to do it with what you have; the obstacle course is fun, but creating it is even better! Suggest that kids go under the table, over the cushion, through the masking tape maze, around the corner, onto the bed (jump three times! )… You get the idea. What better way to celebrate the month of Love than working out with the people you care about the most? When we start thinking of ways to get fit and eating healthier, it cannot help but trickle down to those are closest to. While Valentine’s Day may be considered a mere Hallmark Holiday, why not use it to your advantage? SCW has put together an exclusive “It’s All for the Love of Fitness” Guide to ensure you and those you care about strive to be the healthiest you can be, all while saving 20%. Granola is one of those rare versatile foods that is easy to make in a large batches and is an excellent addition to any meal, which makes it a go-to for us during the busy holiday season. It can be used at breakfast with yogurt, as a snack in the office and even as a topping on a dinner salad! 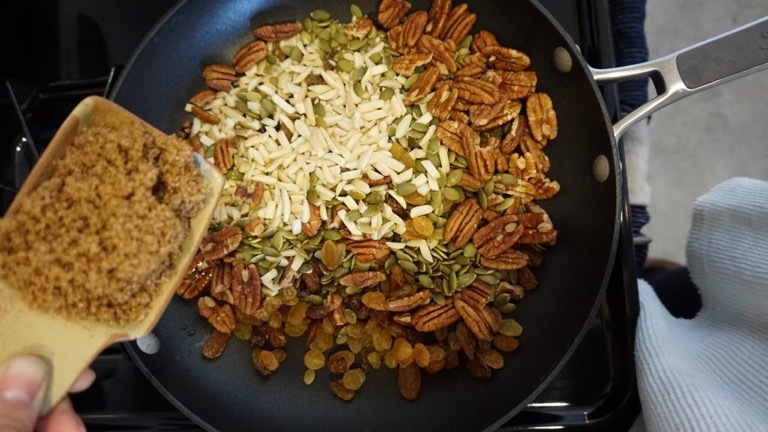 Grab our Holiday Snowflake Granola recipe below, plus our bonus go-to salad recipe! Combine all dry ingredients in a large frying pan over medium / low heat. Stir lightly (on and off) for about 10 minutes. Transfer to a parchment lined sheet pan and let cool. 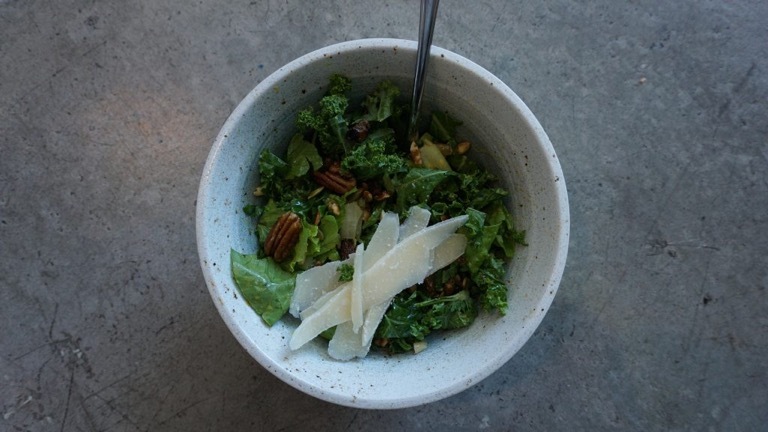 Once cool, add to your favorite salad, yogurt or have as a snack.